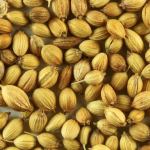 We offer Coriander seeds that are rich in aroma and package the coriander in a way that all its nutritional values are retained. It is quite a popular spice across the world owing to the health benefits. It is also known to be a traditional treatment for those suffering from Type 2 Diabetes. It also helps prevent hair loss and often used in the face packs made at home thanks to the anti – bacterial properties.